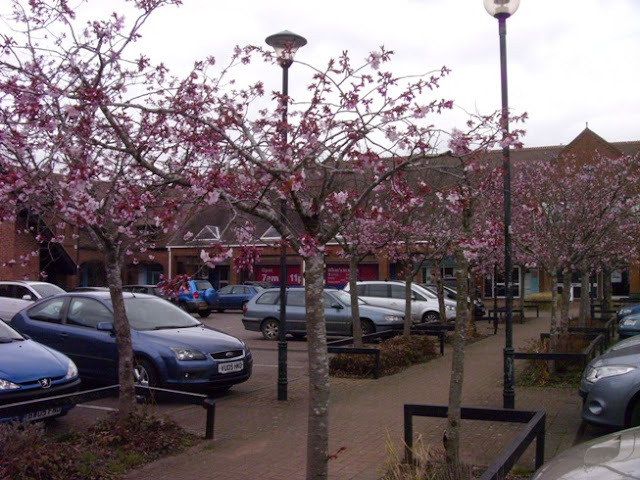 This is an avenue of small cherry trees just coming into flower (in Shaw Village centre, West Swindon, 22/4/13). 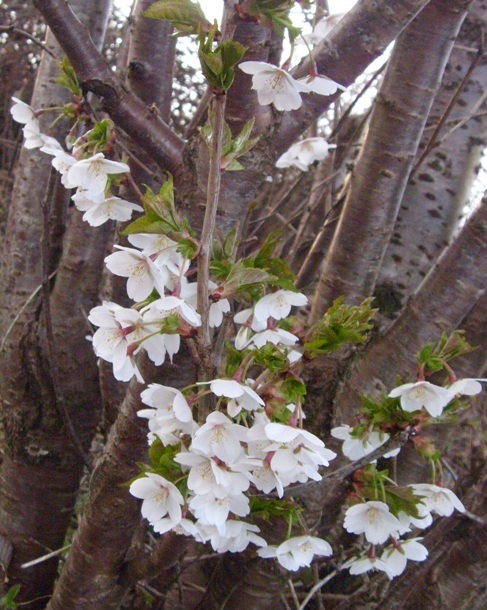 They are one of the many types that come into flower just ahead of 'Shirotae'. 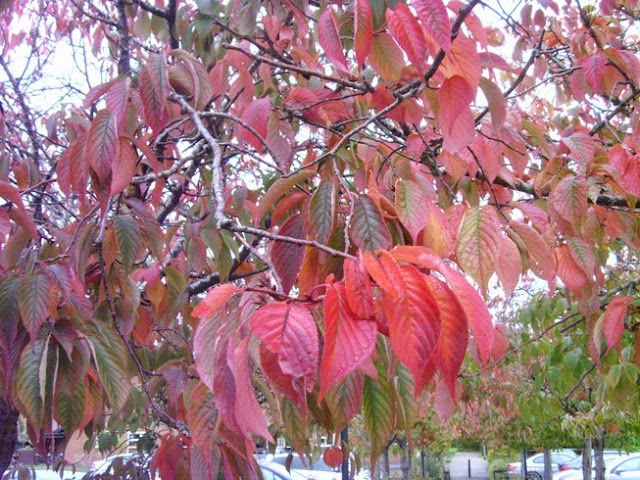 I tend to vaguely lump them all together as Sargent Cherry, which in this case is probably right. 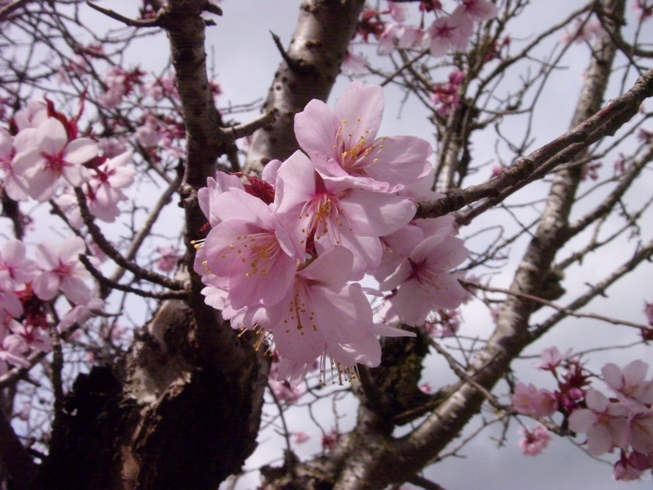 The petals are flushed with pink when they first open (above, right). They quickly turn nearly white (above, left); at the same time the dark-red star shape in the middle of the flower becomes more prominent. On 2nd May I went back to have another look at them. 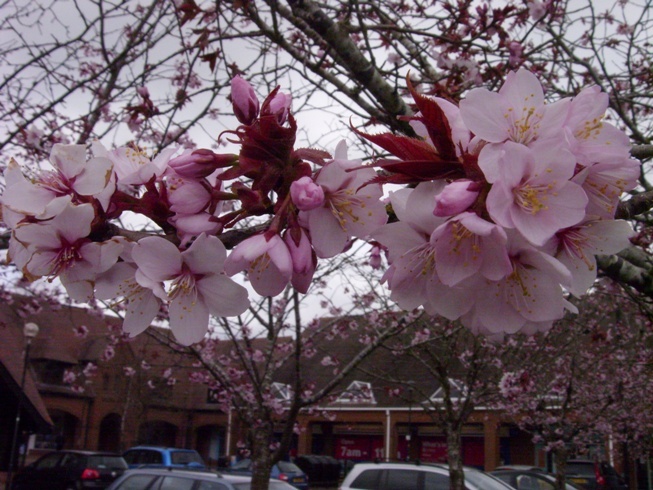 The blossoms were pretty much over; ten days is a long time during the blossom season! 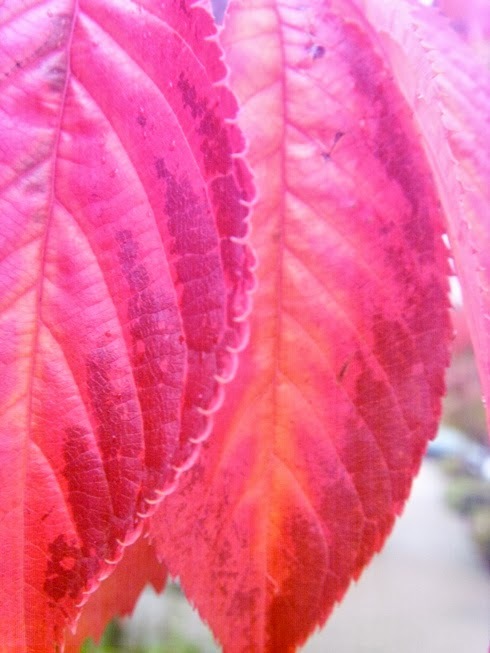 But I photographed the young leaves. Those elongated leaf-tips convinced me that this was indeed Prunus sargentii. On September 19th I was back again, and here were the early and reliable autumn colours for which Prunus sargentii is well known. 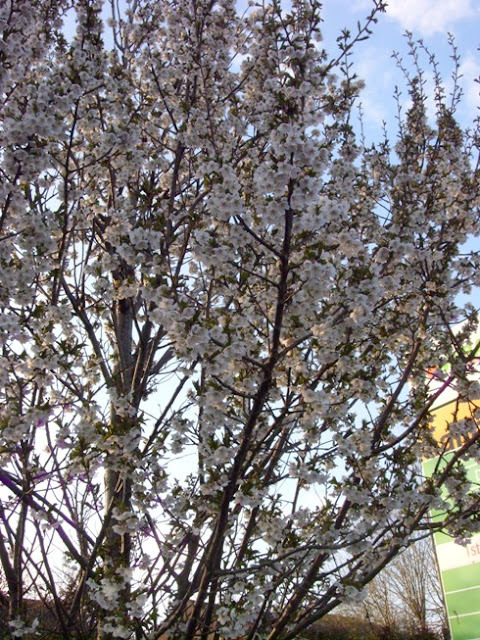 Note (March 2017): I'm sorry to have to report that these Sargent Cherries in the middle of Shaw village centre were removed some time in the winter of 2016/17, and replaced by what looks like some kind of Amelanchier. 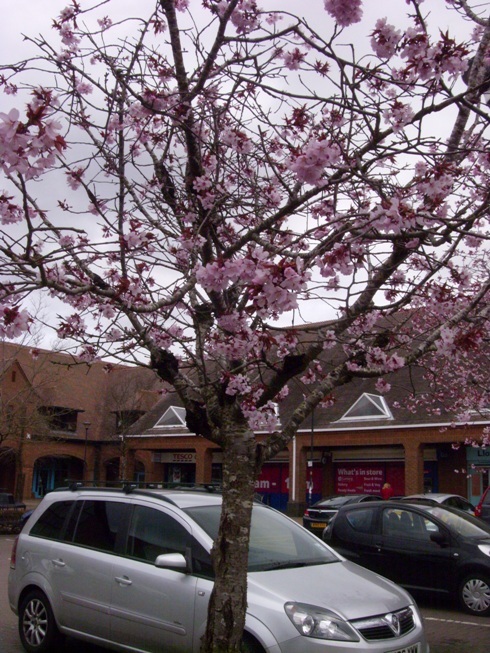 The Sargent Cherries in the car park of the Village Inn are still there, for now. 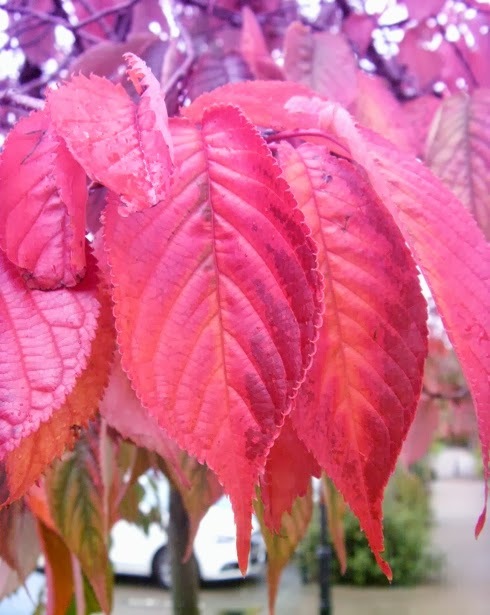 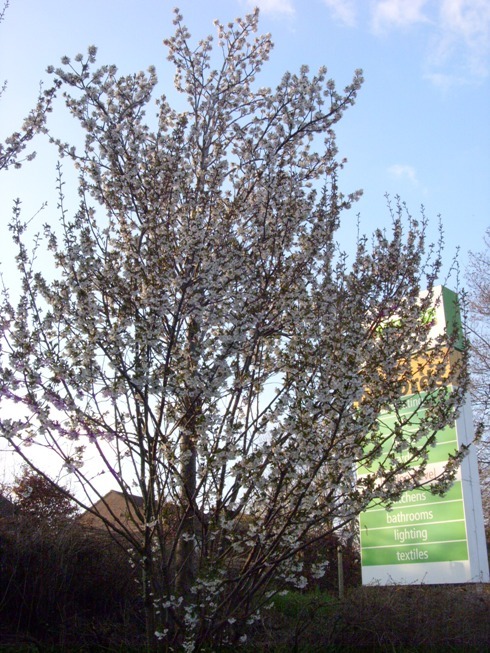 This is Prunus 'Umineko' - the combination of white petals, emerging green leaves, red bud-scales and calyx, is highly distinctive. So is the egg-shape of the crown, with all those ascending branches springing from near the base of the tree. 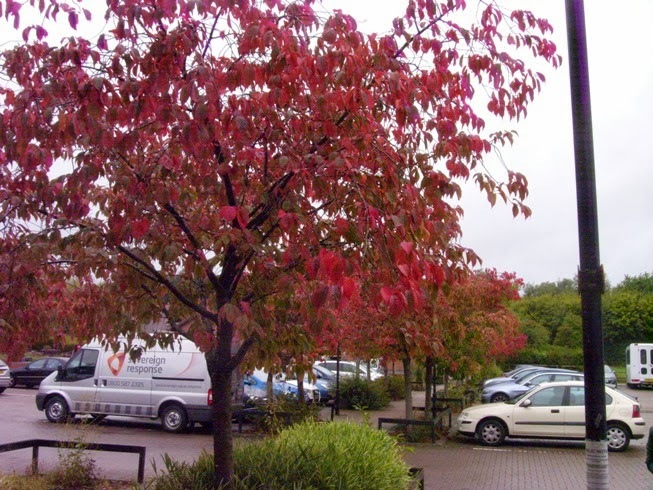 Photos taken in Homebase car-park in Frome, 21/4/13. 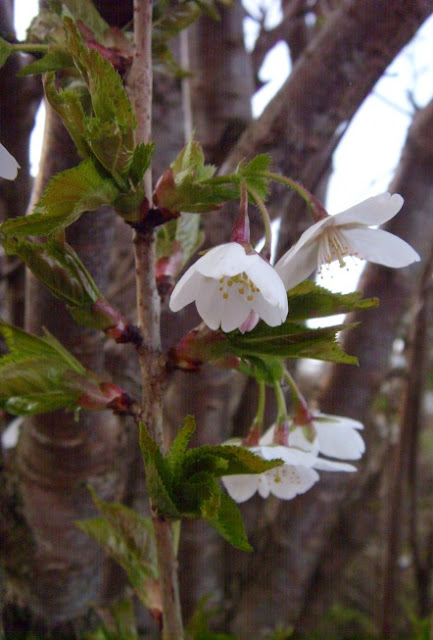 P. 'Umineko' (which means Sea-Eagle) is a cross, raised by Collingwood Ingram in the 1920s, between two Japanese species P. incisa (Fuji Cherry) x P. speciosa (Oshima Cherry). 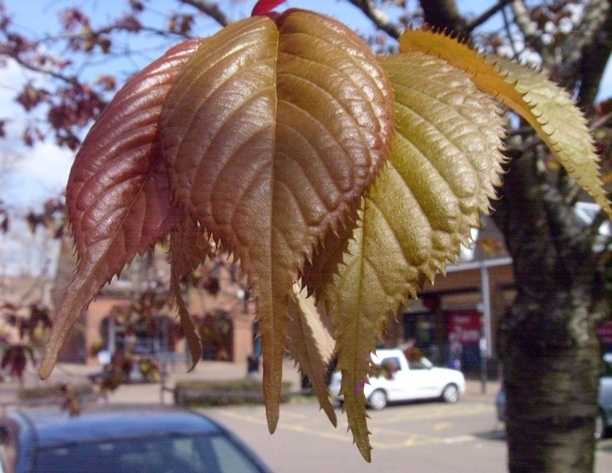 This tree was "rare" when Alan Mitchell wrote Trees of Britain, but is now a common planting. 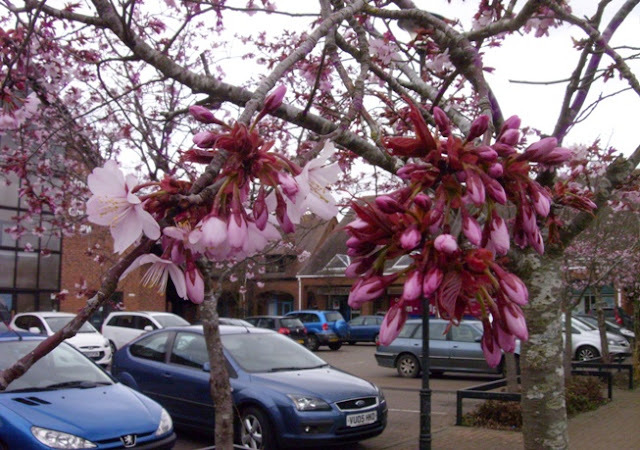 A cross of the same two species arose later in Holland and is known as 'Snow Goose'.